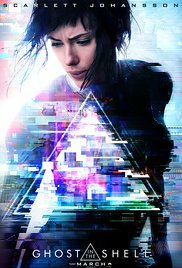 I didn’t hate everything about the 2017 Ghost in the Shell remake. If I weren’t a huge fan of the 1995 anime film, I maybe even would’ve liked it a lot. But alas, the remake falls as flat as anyone who stands in the Major’s way. I debated for a long time whether I even wanted to see the remake. There’s of course the whitewashing issue of having most of the main characters played by white actors (more on that later). There’s also my general fatigue with Hollywood remakes and sequels (although I’d be lying if I said I weren’t as excited as I am apprehensive about the upcoming Alien and Bladerunner sequels). But this particular remake didn’t seem like it needed to happen. I don’t watch a lot of anime, but Momoru Oshii’s 1995 anime film is nothing short of a masterpiece of philosophical science fiction (see my post: "Buddhist Philosophy and Ghost in the Shell: Studying the Ghost to Forget the Ghost"). One does not simply remake a masterpiece. The analogy on my mind the last few months is that it would be like if someone told me they were remaking 2001: A Space Odyssey. Even in the hands of skilled writers, cast, and filmmakers, this is a bad idea on the face of it. Even a perfect remake would fail to stand up to the original. And the Ghost in the Shell remake is far from perfect. Imagine if someone remade "2001: A Space Odyssey" and inserted characters who continually spouted plot exposition to make sure you did not exercise any brain cells to consider for yourself what was happening on screen. I decided to see the remake, but I told myself I would go in with my expectations set appropriately low for a typical $100 million action-driven Hollywood sci-fi spectacle – something more in Michael Bay territory. I don’t regret seeing it. I can report that the remake steered clear of Michael Bay territory. It is a beautiful and visually intriguing film that does capture, and in some ways expands, the look of the anime. I was glad I saw it in IMAX 3D. The hundreds of people who contributed to creating the rich textures of this unnamed Hong Kong-inspired cyberpunk megalopolis deserve a lot of credit. I’m tempted to see it again just to behold their work. I enjoyed the score, which is like a mash up of the original score and retro-synthy goodness à la Stranger Things (although I really miss the meditative city scenes that accompanied a lot of the original score). I even thought most of the actors, including Scarlett Johansson, did a great job. Johansson is a bit understated, but she’s a weaponized cyborg with identity issues, so what do you expect? My main criticism is philosophical: namely, there’s hardly any of it. Instead of the original's deep meditation on personal identity and what it means to be human, we are told explicitly what it means. Twice. (More on that in the spoilery section). Instead of delving into questions of the ethics and metaphysics of artificial intelligence, we are supposed to assume without complication that the Major’s human brain gives her a “soul” or “ghost” that mere machines lack (an assumption that is artfully and carefully undermined in the original, at least if you pay attention). The plot of the original anime is labyrinthine and involves at least two shadowy government agencies and even shadowier corporations; viewers are led into this labyrinth but never entirely emerge. We are left with more questions than answers. The plot of the remake turns out to be the ho-hum revenge-against-an-evil-greedy-organization-for-the-sake-of-individual-freedom plot that you’ve seen a thousand times. There’s even a bizarre sort of love story (but not the one fans of the original would expect). By the time the credits roll, answers have been neatly packaged for mass consumption. So, should you see this movie? If you want plenty of candy for the eye without nourishment for the mind, then: yes. That’s not a bad thing per se: I’m one of the few people who had nice things to say about Jupiter Ascending, after all! But Jupiter Ascending was not an attempt to remake a masterpiece. This is, and it predictably fails to live up to the original. You are now entering spoiler zone. SPOILER ALERT! I can’t fully discuss the whitewashing issue without some major spoilers. So get ready. Don’t say you weren’t warned. When I heard the Major would be played by Scarlett Johansson, I didn’t know what to think. The Major is a cyborg with a human brain and robot body. The original takes place in a city that was inspired by Hong Kong, but everybody speaks Japanese. The story obviously has roots in Japanese manga and anime, but it’s not supposed to be specifically Japanese as far as I can tell. Apparently Oshii himself thought Johansson was a great choice. But on the other hand, it would be good to see more diversity in Hollywood movies, especially in leading roles. There may be no particular reason the Major has to be Japanese, but there’s no particular reason she has to be white, either. I liked Pitou Asbaek’s Batou alright (I guess the animated Batou looks a bit Danish). The other major character, Aramaki, is played by Japanese actor/director “Beat” Takeshi Kitano, who speaks Japanese throughout and is understood by and understands the English speaking cast as if this were a Star Wars movie. Singaporean actor Chin Han plays Togusa, whose part is sadly downplayed in the remake (he’s one of my favorites in the original). Famed French actor Juliette Binoche is fine, but seems about as confused to be in this movie as I was to see her in a science fiction film. The "villain" Kuze is played by Michael Pitt, who is okay, but nowhere near as interesting as the original's Puppet Master (the fact that there's no Puppet Master in the remake would alone ruin it for me). The rest of the cast is fairly diverse, which makes sense as this is apparently a non-specific East Asian multi-ethnic megalopolis with a past of substantial international immigration. So is this movie whitewashed? Yeah, kind of, but maybe not as straightforwardly as it appears. We eventually learn that the Major’s current appearance is different than her original human body. In fact - major spoiler here! - her name used to be … wait for it! Motoko Kusanagi, which fans of the original will recognize as the Major’s name in the anime. But in the remake we learn that she was a runaway who was kidnapped and we meet her grieving mom (Kaori Momoi), who she doesn’t quite remember, but who somewhat recognizes her in the body of Scarlett Johansson (her cat, of course, knows it’s her immediately). It also turns out that a similar thing happened to Kuze, who used to be a (presumably Japanese) guy named Hideo (and unfortunately not, like the Puppet Master, an AI who came to exist in the seas of information). There’s little philosophical depth, however, when it comes to the major questions of the original concerning personal identity. We are told twice in no uncertain terms that identity is a matter of what you do, rather than your memories. I have little idea what this means. Apparently we should reject psychological continuity criteria like John Locke’s, according to which memory is the main criterion of identity over time, and reductionist views like that of Buddhist philosophers, according to which a “person” is a convenient designator that ultimately reduces to impersonal causal continuity (unless maybe “I-making” is one of the actions that counts?). I guess the remake theory is supposed to be the idea that your past doesn’t determine who you are, like a riff on Sartrean existentialism or some sort of blank slate metaphysical libertarianism, but the kind that a pretentious guy BSing at a coffee shop would misinterpret from a Wikipedia entry. Sartre says you should freely choose your past, which I always took to mean something more like taking ownership of it rather than deliberately forgetting it. While I admit to finding the type of causeless cause required by some forms of metaphysical libertarianism to be mysterious (I’m a compatiblist if you press me on it), I find it hard to imagine constructing an identity with little to no regard for memory. Why would you even need a sense of identity over time if memory was unimportant? Maybe the idea is a sort of Aristotelian or Confucian virtue ethic according to which ethics is about developing good habits in order to act virtuously (hence, the emphasis on action). But the baldly stated remake theory seems to indicate that a people who do random things for random reasons with no connection to their past or future would be the best kinds of people to be. Aristotelianism and Confucianism on the other hand require careful attention to your moral education, which of course requires memory and the ability to learn from moral exemplars. Maybe there’s more depth to whatever the remake theory is, but I’m having trouble finding it. Besides, there’s something weird about asserting that memory doesn’t matter when the whole thing driving the plot is a search for missing memories wrapped in a crimson cloak of vengeance. Now I feel like I’m trying to dig deeply into shallow ground. But why do that when there are as of yet unmined riches in the original anime? I appreciate this post brother, but I cant fully read it, until I see the movie first. I will say that I have already concluded that if the movie does not touch the philosophical points of the original I would be disappointed. If the remake does not end the same way the originals does I would be disappointed. Just by skimming this post I'm getting the impression that they didn't stick to the meat of the story. What a disappointment. Now Ghost will be just another sci-fi movie and not the cult classic I fell in love with as a child. Thanks for your comment. If you love the original anime, I doubt you'll like the remake. It barely touches on some of the philosophical points of the original, but not in very thorough way. But I did like the visuals. Feel free to come back after you've seen it and let me know what you think! What is this Ghost in the machine be without the philosophy; what can it be without the control of time through the control of the frame rate, the slowing down when the landscape is at its greatest? I hope they don’t remember that Hayao Miyazaki stunning Nausicaä of the Valley of the Wind. I don’t care about casting, I have seen Johansson in all the Marvel movies, but I wouldn’t have know if I had not just read her Wikipedia page, I’m just thrilled to see Natasha Romanova come to life, and that is all I see on the screen, and its not only the philosophy but the animation that draws me to the films mentioned here; they take film making back to moving drawings, frame by frame they reveal a world with fewer restrictions that actor lead movies. Not that every film be animated, but it works for these films, and of course there are actors involved, we hear their voices all the time. What I love about these films is my experience of watching them is similar to reading a really good novel. I dislike philosophical Sartre, but there is a set of paragraphs in his Nausea when the narrator looking at a painting of a now dead local hero, he describes the painting, he looks at its oddness, its strange dissertation of scale, and as he does so, as he moves on the actual descriptions of the living person, the gap between grow wider, in comic, pathetic and extraordinary ways. They compare because when ever I got to that passage I would read it again and again, but I have never got passing it. I find myself having to watch scenes again and again; it may be odd to get that experience from a series of drawings or a series of words, but its not something I worry about. I don’t get that sense from Marvel Films, or all novels, and I can’t imagine the possibility in this recreation. I have got to watch those animations again. Again-- What is this Ghost in the machine be without the philosophy; what can it be without the control of time through the control of the frame rate, the slowing down when the landscape is at its greatest? I hope they don’t remember that Hayao Miyazaki stunning Nausicaä of the Valley of the Wind: Nothing but the absence of their greatness, and if you have not watched the original you may not notice the absence but I think you can. Thanks for the comment. I'm not entirely sure I'm tracking everything here, but I think we're in agreement that the philosophical aspects of Ghost in the Shell are essential. It's not so much that they're totally lacking in the remake, but they're not handled nearly as well or as deeply. It is fun to write about Ghost in the Shell, which for some reason I keep confusing the shell with the machine. I haven't watched the remake, but eventually I will watch it when it appears on Netflix or Hulu. This makes it clear that I have not yet watched film, but I am invested in the originals, although I worry about an investment with an idea in a the superiority of an original. [The films are a recreation of an a seine manga created by Masamune Shirow that I have not read.] Perhaps, when, or if I watch the film, should I watch the new movie, I would/will have to watch the movie as though the action movie is a mediated viewing of the animated film, mediated by time, culture, and different economical models. I would like to believe that the creators of the animated film will reap great financial rewards, (does that ever happen), but still while the animated version are available on Hulu, for the time being that is where I will be. "Remember, we will always have, part hand drawn, and computer animated, Japanese cultured, eastern northern Asian megatropolis to which we can return. It is fun to write about Ghost in the Shell! I haven't read the manga, either, which would I suppose be the true original. But as you say, the original shouldn't be preferred just because it's original. A remake could be better. In this case, though, I really prefer the anime as a film on its own terms, although I admit I liked the live action remake less in large part because I like the anime so much. I watched the remake first and loved it. Then immediately watched the new 25th anniversary edition of the anime original. Then wanted some validation in the heavy Buddhist themes all over the place and found your first article on the original anime film, which led me to this review. I loved the new film and I'm a film professor btw lol. I am not a fan of anime, and the English dubbing was distracting and the acting was so bad and also I found the laberenthine plot difficult to track, but this is true of many great movies like (The Big Lebowski), so no shade there. But those are just the first visceral reactions. Your articles helped me better understand and appreciate both works. I wanted to limit myself to commenting on your question of the remakes "theme mantra" re: you are not your memories but what you do. Ok, so I heard that and I first thought: Buddhism, but made so much more complicated by her quest to regain her memory, to find out who "she really was." Her quest for indentiy is centered around this question of memory, vs the original Major who is tortured because she is unsure if having a human brain truly equals a soul, or is she a synthetic human. I found this mantra so at odds with the text of the film, I struggled unpacking it over Moscow mules with my fiancé lol . So in Buddhism there is the notion to be free, you must live in the present, do not mire yourself in regrets of the past or anxiety over the future. Your own thoughts to an extent are just noise, a cacophony of the pychological continuation, they are not to be mistaken for the "self". OMG pleeeez correct me here if I'm wrong lol, as a neophyte Buddhist practitioner I could be one of those people in the coffee shop quoting Wikipedia! Ha! Soooooo this was a quick concept to understand, the harder question is the quest to find out who she was. I thought by the end she knows who she was and that for her and all of us feels necessary. But she is able to walk away from that, when she chooses to stay in the city and not runaway with her "past". she doesn't let it define who she is now, she can hold both her past, her psychological continuation with her sense of freedom in the now. She is here for justice, that was kinda lame to say I'm dialogue tbh, but I took it to speak to moral ethics and her pursuit of them. I'll stop here, loved both your articles and thanks for writing them! Thanks for your comment! Sorry, it has taken me awhile to reply, but I was spending some time at the Chattanooga Film Festival the last few days, which I suspect as a film professor you can appreciate. The plot of the anime is complex. I've probably seen it five times and I think I only partially understand what's going on, especially with the political situation. Maybe that's explained better in the manga. That's an interesting point on being in the moment. The emphasis on being in the moment is more of an East Asian Buddhist idea, especially in Zen probably through a Daoist influence, although it can be found as a meditation technique in other forms of Buddhism (like Vipassana). Also, radical momentariness was endorsed in many Indian Buddhist schools early on, but it's more a theory about the nature of reality than anything like contemporary ideas of "live in the moment, man," because each moment is causally conditioned by the past and in turn conditions the future. I briefly considered something like your point to make sense of the mantra of the remake, but I probably didn't give it enough thought because the remake seems to have a very Hollywood notion of selfhood as a heroic overcomer of all. This seems to bolster a far more substantial view of self than any Buddhist would endorse. On the other hand, you make a great point that if the remake theory is that the IDEA of self is created each moment, then that is an idea that can be found in Buddhism (in early Buddhist texts there is even a process called "I-making"). But to pretend that there is some essential self being created in each moment that is not causally conditioned by the past is incompatible with most Buddhist theories of causation. So, if the remake theory is understood to mean that the Major's sense of self is created in each moment in dependence on causal factors but not on a substantial, underlying self, then that would seem pretty Buddhist. If, on the other hand, the theory is that there is ultimately some essential self that is freely chosen by itself in each moment independent of past causal factors, then this sounds more like Sartrean existentialism (the Hollywood version, anyway). So have I been a little unfair to the remake? Have I let my love of the anime keep me from adequately exploring the remake? Maybe. Thanks for keeping me thinking about this! I appreciate this mindful critique, best I've read thus far. Ghost in the Shell is my favorite anime all time. I did enjoy the film quite a lot despite the watering down of the philosophy though the more I think about it, the more I wish I was on the writing team (lol). I'm in the process of working on my own critique for a creative fiction blog I want to start, which I believe clarifies some of your confusions about what the philosophical basis of the remake is, even if they avoided exploration of their own ideas. I actually felt the direct "undermining" of the original philosophy was somewhat refreshing in this sea of Gnostic, New Age and "western Buddhist" trends of the day. Also the remake maintains a very forward looking vision of the future, which ironically realizes the prophetic visions of the original's universe in it's step from international conflict to the corporate capture of government, while fusing elements from the original film, the TV series and manga (with new elements). Maybe we can talk when I finish my critique, and exchange some ideas. Thanks! I will look forward to reading your thoughts when your blog is ready. I'd love to hear more in particular about where the new film is coming from philosophically, since that wasn't entirely clear to me. I think I find the new being created from the fusion of the Puppet Master and the Major just so much more interesting than what the Major becomes at the end of the new film (I'm trying to avoid spoilers, so I'll leave it there). But maybe I missed something! History of the title; Gilbert Ryle in his book, Concept of mind that was published in 1949. It is a book that I would have come across as an undergraduate; Gilbert Ryle, his book, the Concept of the Mind was a sustained criticism of Rene Descartes’ Medications; Ryle labels ideas of a mind or spirit as dogma. Also Koestler, who wrote the book Ghost in the machine, and is critical all of these factors that we believe makes us special, or/and different from all other animals, and machines, we think that we are so wonderful yet, despite our self-appointed genius, we may delusional mistake, an error in the tree of evolution. However, within Zen Buddhism its Tibetan forms, the shell, as conch is one of the sacred special symbols. Much as I would like to, and I could write about the differences between Buddhism’s, with Zen Buddhism, and Pure Land Buddhism (one of the main forms of Buddhism, in China, and Shinto, but I would only demonstrate what I do not know. But, there, is that the tip of an elephants trunk you can see or is it it's tail(that was satisfying--is it it's tail): There is a problem with assuming that the creators of the manga or the film have a deep knowledge of these religious and philosophical traditions and are consciously referring to them; consider if you will the series, The 4400,the character Jordan Collier is killed returns from the dead, rough and worn out and as he comes out of his facial hair and begins to becomes mid-America Jesus; yet did you think, as soon as he came back alive and in the company of tramps that the narrative might take a messianic turn. There are these elements that are accessible through acculturation. I said that the city was an unnamed megacity, but it is so obvious that it is Tokyo. The things I could tell you about what I don’t know about Buddhism. That Japanese Buddhism have their own histories: Pure Land Buddhism, and not to mention Shinto, with its divergent strands. The regular clanking sound, bell? when the Major is speaking brings in the Pure Land Buddhism, probably. And I am considering the possibility that the creators of the manga and those of the film might have a cultural. Yes, I think the Ryle title is the main inspiration, which is interesting since Ryle is explicitly arguing against there being any ghost in the machine! I'm not claiming that the creators of the manga or anime have any deep academic or practical knowledge of Buddhist traditions. As you point out, Buddhist themes could be absorbed by some people from the larger culture in Japan the same way that Christian themes could be absorbed by people in many Western countries. Cool! I will check it out soon!